Abstract: This chapter explores the relationship between technological change and regulation in both directions. New technologies such as artificial intelligence, machine learning, and distributed ledgers are likely to drive structural changes in decades to come, not least in the way firms comply with regulation and how regulators enforce regulation. Regulatory technology, or ‘RegTech’, presents opportunities to reduce the regulatory burden on firms and make regulation more efficient and less harmful. On the other side, regulators need to come to terms with new technologies that may challenge existing business models or regulatory constructs, and we propose policymakers adopt a ‘permissionless innovation’ principle in response, ultimately allowing experimentation with new technologies by default unless direct harms can be demonstrated. Abstract: It is widely acknowledged in political circles that Australia has a high red tape and regulatory burden. However little scholarly attention has been directed towards understanding the extent and significance of that burden. This paper describes why red tape and regulatory reform should be treated as a particularly significant priority for a small, open economy such as Australia’s. Australia faces a number of economic and fiscal challenges and is likely to become more exposed to macroeconomic fluctuations in coming decades. Red tape and regulation slow adjustment to changes in that environment among individuals and firms. The red tape and regulation reform program should be seen as a central element in making Australia more resilient to local and global economic shifts. Red tape costs the Australian economy as much as $176 billion a year. Governments create and enforce thousands of regulations on our workplaces and our communities. These rules slow and prevent businesses forming, people from flourishing, new technologies from being adopted, and hold back Australia’s global competitiveness. 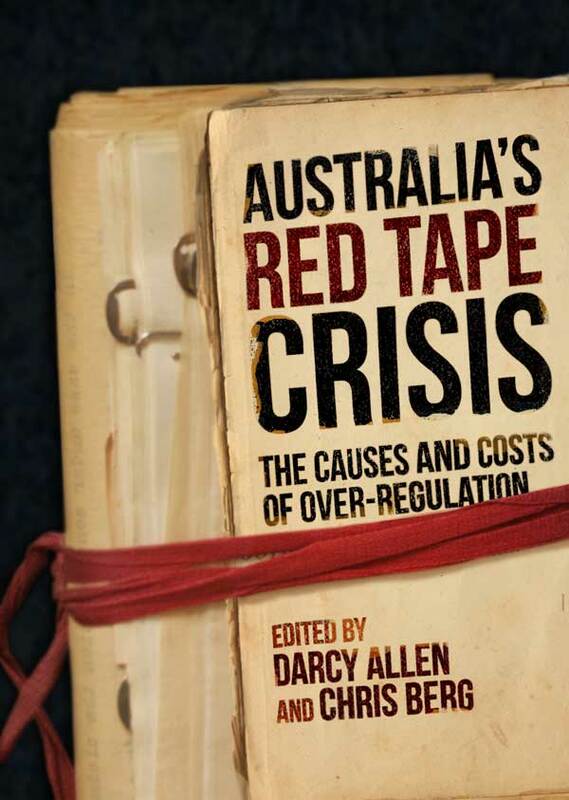 Australia’s Red Tape Crisis is an exploration into the economics, politics and culture of over-regulation. How should we structure our federation to achieve reform? Why should political responsibility sit with the elected? Does Australia have a deep desire for a federal bureaucracy? What is the future of red tape reduction policies? Together, the contributions of economists, philosophers, politicians and lawyers help define a path for overcoming Australia’s red tape crisis. Abstract: Ronald Coase famously argued that “if an economist finds something – a business practice of one sort or other – that he does not understand, he looks for a monopoly explanation”. So it is with credit card interchange fees. Intellectual confusion has led to the phenomenon of interchange fees being misdiagnosed as being a monopoly problem leading to inappropriate policy intervention. Following George Stigler’s path breaking analysis of the US Security and Exchange Commission he claimed that financial regulation was “founded upon prejudice and … reforms are directed by wishfulness”. In our opinion, Australian regulatory attitudes towards interchange fees should be placed into the same category: reforms initiated by ignorance and anti-bank prejudice. Australia is a country with enormous potential. We have some of the most productive and technologically advanced primary industries in the world. While agriculture is only 2.3 per cent of GDP, Australian agriculture produces enough food to feed 80 million people. Yet this productivity and potential is being limited by poor public policy settings. In this speech I’m going to outline the cost and consequences of red tape on Australia’s economy and primary industries – how large the burden of red tape is, how much new red tape is introduced every year and the enormous army of bureaucrats employed to invent, design and enforce it, and how it puts us behind our international competitors like Singapore and the United States. I’ll then explain how red tape reduction efforts have failed and how they can be revitalised. Red tape can be cut, as it has been in other countries like Canada, Sweden and the Netherlands. Finally, I want to briefly reflect on the moral consequences of red tape – how it prevents us from achieving the human flourishing that should be the goal of every policy approach. But I should start with the big picture. Australian Commonwealth governments have been unable to return their budget to surplus after the dramatic increase in spending by the Rudd government. We are now spending almost as much as that government did in their extraordinary stimulus ever single year. Expenditure for 2016-17 is projected to be 25.8 per cent of GDP, compared to the 26 per cent of GDP which was spent in the crisis year of 2008-09. Australia’s gross public debt will soon rise to over 30 per cent of GDP. The Australian government owes its creditors half a trillion dollars. This will have to be paid off by our generation or the next. Until then, each year we are paying interest on that sum. In 2016-17 the Australian government is expected to pay $12.6 billion in net interest payments alone. To put that in perspective, this is almost as much as the Western Australian government spends on health and education combined. The facts I have outlined are well known, if rarely stated in these stark terms. Each government since the Global Financial Crisis has promised to return the budget to surplus and ease the debt burden on the Australian economy, but each government has failed to do so. The Coalition has been unable to reduce spending to the levels needed to make the budget balance. Given that spending cuts seem to be off the cards, and the economic consequences of increased taxation would be harmful – there is only one other trigger left that would restore our public finances. We need to focus on economic growth. Governments need a singular focus on growing the economy out of fiscal mess. If we are to learn to live with big government we need to be able to pay for it. Growth would return those on unemployment benefits into work. Growth would increase government revenues without increasing the taxation burden on individuals and businesses. Growth would ease the strain on social services, allowing more people to fund their own healthcare and education. Growth brings about increases in living standards, it brings innovation and technology to yield positive environmental outcomes, and most importantly, growth brings human flourishing – the ability for us to be the individuals, and the society, we want to be. I’ve given this lengthy introduction to a discussion about red tape and agriculture because it’s vital to understand what Australia’s heavy red tape burden means. By throwing up barriers to enterprise and development, red tape means a slower economy, less opportunity, lower living standards, and fewer people innovating, creating, and serving their communities. In the last decade, between the years 2006 to 2016, Australia’s real GDP growth has been just 1.1 per cent per year. In the IPA’s analysis, the answer to the question of why Australia has not recovered from the Global Financial Crisis as it recovered from the recession of the 1990s or the economic upheaval of the 1970s is over-regulation. Governments now see their role as interfering in markets and controlling business with red tape and unnecessary regulatory control. The result is unprecedented legislative hyperactivity whose consequences we are now seeing in slower growth and prosperity. It took the Commonwealth just 358 pages of legislation to set the federal government up in 1901. But in 2015 the Commonwealth passed an impressive 6,453 pages of legislation. That doesn’t include all the subordinate legislation – thousands more pages of spiralling rules and regulations governing what businesses must do before they can expand and employ. Nor does it include all the state legislation its subordinate legislation. Or the local government bylaws and requirements. Or what political scientists call quasi-regulation: the codes of practice, standards, and requirements that are imposed by industry bodies on the government’s behalf. This sheer volume of legislative activity is itself damaging. The constant revision of rules and regulations means businesses have to dedicate resources to monitoring and interpreting the whims of parliament and a growing number of regulatory agencies. By our count there are 497 bureaucratic bodies involved in the design, implementation and enforcement of red tape at the Commonwealth level alone. Businesses are used to the uncertainty of market competition – the shifting winds of the global economy, changing exchange rates, the preferences of consumers – but we are increasingly asking them to be political soothsayers as well – to monitor and predict the whims of the political class. We should not underestimate the uncertainty this brings about. Economic certainty and the rule of law, thought Fredrich Hayek, was the bedrock of Western economic growth. Uncertainty about current or future red tape makes it risky to invest, employ and to grow. The consequences of red tape and uncertainty are being felt across the economy. For all the enormous innovation and technology that drives our living standards forward, on a number of traditional indicators the Australian economy is less dynamic than it has been in the past. Fewer new businesses are being created now than they were ten years ago. The Australian Bureau of Statistics says the number of new businesses that enter the economy each year has plummeted from 17.4 per cent of all businesses to 13.4 per cent of all businesses between 2003 and 2015. How many potential firms have we lost in the last decade because Australia’s red tape has been seen as unattractively burdensome, or the future regulatory environment to unstable or uncertain? The Commonwealth government estimates that red tape imposed by the federal government costs the Australian economy $65 billion a year. Commonwealth public servants use a range of techniques to come to that estimate, such as surveying regulated firms to find out how much time they spend on complying with paperwork and bureaucracy. But the amount of time filling out forms is only a tiny sliver of the burden of red tape. Red tape does more than impose paperwork – it slows and reduces investment, it distracts businesses from more profitable endeavours. Earlier this year the Institute of Public Affairs came to a new calculation of the burden of red tape on the Australian economy. We did so by looking at the relationship between the World Bank’s “regulatory quality index” and real GDP per capita using a method developed by two American economists in 2014. We find that red tape costs a massive $176 billion to the Australian economy. Let’s just pause for a moment and look at what that means. It means that the government’s best estimate has underestimated the burden of red tape by more than $100 billion. It means that the red tape burden constitutes 11 per cent of Australia’s GDP. It means that the red tape burden is larger than any other Australian industry. It means that red tape costs each Australian household on average $19,300 a year. And, fundamentally, it means that red tape is the single largest burden on the Australian economy. While Australia tends to do very well in many global comparisons of government stability and corruption, the World Economic Forum has found that we are in the bottom half of the world when it comes to business perceptions of the burden of government regulation. This means that Australia has a heavier perceived burden of regulation than Singapore, China, Canada, the United States, and New Zealand – that is, those countries with which we compete. Each individual permit, licence, or government approval looks trivial and minor when it is first introduced, but they add up. The Australian Business Licence Register lists more than 30,000 licences across the country. The Roy Hill iron ore mine required more than 4,000 separate licences, approvals and permits in its pre-construction phase alone. Many more have been required for production and operation. A recent Deloitte report suggested nearly 10 per cent of the mining workforce is dedicated solely to regulatory compliance. The Consolidated Pastoral Company has estimated that it is required to comply with more than 300 pieces of legislation, regulations and codes. But red tape hurts small businesses even more than large businesses. The Australian Chamber of Commerce and Industry has found that 47 per cent of small and medium businesses in Australia were prevented from making changes to grow their business from the weight of red tape. Large firms can dedicate the resources to monitoring and complying with regulation. They can hire lawyers and economists and consulting firms. A small business with less than 20 people typically has to rely on its owner-manager to do this work. Not only will this person lack the training and specialised knowledge required, but every moment spent on regulatory compliance is a moment not spent on innovating, adapting and adjusting to the demands of the market and clients. A 2013 survey by the Australian Institute of Company Directors found that red tape and workplace relations regulation were second only to general economic conditions as barriers to productivity growth. But the 2016 election was the first election in recent memory that neither party offered a significant red tape reduction plan. In 1996 John Howard promised to halve the red tape enveloping small business. In 2007 Kevin Rudd declared that red tape was eating away at the enterprising spirit of small business. The Rudd government established the Commonwealth’s first minister of deregulation. In 2013 Tony Abbott promised to cut $1 billion worth of red and green tape a year. But in 2016 the only notable mention of red tape was buried in page 19 of the Coalition government’s National Economic Plan, with a promise not of reducing red tape but of spending $5.6 million to “systematically review regulatory regimes”. The Abbott-era red tape reduction programs – like the special parliamentary sitting days dedicated to repealing legislation – were quietly cancelled earlier this year. This is, to be fair, not due to any lack of political will. Many of the red tape reduction policies were stymied by the Senate. For example, the government was unable to reform – not abolish – the government’s workplace gender reporting requirements. The requirements are the definition of red tape. The require firms with 100 employees or more to report to the government the gender composition of their staff, pay rates for men and women, and flexible working arrangements. The government does nothing more than collect this information – it imposes no obligation on firms to do anything differently. Gender reporting requirements are both intrusive and pointless. But the government withdrew the changes when it learned how much of a backlash awaited it. Likewise, modest changes to the regulation of financial advisors to avoid some of the perverse and unintended consequences of increased regulation under the Labor government, were rejected by the Senate. Politics is not the only barrier to red tape reform. As the Abbott government found, the public service itself has an obvious interest in maintaining its grip over the Australian economy. In July this year the Canberra Times reported that the Coalition’s policy to link senior public servant bonuses to red tape reductions – effectively a pay for performance measure for deregulation – had been ignored and refused by those public servants who were supposed to implement it. Last month the Productivity Commission released its draft report into the regulation of agriculture. The commission’s found that agriculture was subject to a “vast and complex array” of regulation and red tape, that affects every part of the supply chain. That red tape emanates from state, local and federal governments and frequently duplicates regulation imposed by other levels of government. Red tape delays the construction of dams, delays innovative new uses of land, and delays the introduction of new technologies like drones. I’d like to briefly focus on one of the commission’s recommendations that illustrates clearly the opportunities and challenges for red tape reduction. The PC found that native vegetation controls harm productivity, are complex and costly, and duplicated across state and federal governments. Rigorously adhering to the requirements of state legislation is no guarantee that the federal government will not override that compliance and impose new costs and controls on a landholder. These native vegetation rules extort landholders and users on the basis of often vexatious claims about biodiversity. The commission recommended that state and Commonwealth governments adopt more market-based approaches to protecting native vegetation. To understand why markets would be better for the environment its worth briefly describing the perverse incentives created by native vegetation regulations. Economists describe property rights as a “bundle of rights” – that is, a bundle of rights to use, exploit, inhabit and sell land. When the government imposes control on the use and exploitation of privately held land they are effectively seizing part of the property rights without compensation to the landowners. From the government’s perspective, it costs nothing to prohibit people from clearing land for their use. They have every incentive to prohibit more and more – particularly if they are driven, as many environmental bureaucrats are, by a deep ideological hostility towards our primary resources sector. The Australian Conservation Foundation’s Andrew Piccone last month described “big cattle, big agriculture and big mining” as “the marginal and unimaginative industries of last century” and a threat to prosperity. Market based approaches to native vegetation protection are designed to fix this incentive problem. Governments should have to pay for the land they lock up – to compensate landowners for the property rights which have been taken and to fund the upkeep of that now undevelopable land. If the Australian community wants to prohibit development it should be asked to pay for the cost of that prohibition – not to fob responsibility onto landowners who suddenly find themselves poorer. But market based alternatives to red tape are a hard sell because so much red tape is designed not to control economic activity but to prevent it. The complexity and cost of so much red tape is no accident – it is driven by political opposition to the primary industries that have underpinned our prosperity. To understand that much red tape is in fact designed to prevent economic activity is to understand why reducing it is so challenging – the special interests who oppose development and growth do not see red tape as merely consisting in form filling or compliance activity, but a tool to stop economic activity. The government’s demand that it approve development is, clearly, the government’s insistence of the right to deny development. With this in mind, how can we reduce red tape? There is an enormous political interest in red tape reduction, and a growing recognition that red tape is the single largest constraint on Australia’s prosperity. But we have surprisingly little information about exactly how much red tape there is on the books. All the political goodwill in the world is not enough – governments which promise to reduce red tape need to be held accountable. Ministers who want their departments to reduce red tape need to know that the job is being done, not evaded. The In most successful red tape reduction in recent history was done by the Canadian province of British Columbia, which has managed to shrink its red tape burden by nearly 50 per cent between 2001 and 2015. British Columbia’s economic performance relative to other Canadian provinces jumped from one of the lowest performing to one of the best. The key to the British Columbia success was verifiability. In recent decades bureaucracies have been encouraged to calculate a total cost of the burden of individual regulations on business. But these calculations are crude and can be easily gamed by bureaucracies and self-interested politicians. Instead the government of British Columbia counted the number of “regulatory requirements” imposed by law – the commands from government that forms need to be filled out, permits need to be obtained, committees need to be formed, and so forth. In 2001 British Columbia had 330,812 of these requirements. As of March 2016, the regulatory requirement count was down to 173,419. Under their rules, no new regulation can be introduced without removing an old one. At one stage the government imposed a one-in, five-out rule. This is the “trust, but verify” approach. We need to be able to see red tape being reduced. Clear and unambiguous reductions in red tape boost business confidence and the willingness of firms to invest in Australia. But the real lesson I want you to take from this is the simple fact that red tape can be reduced. It is easy to be cynical about red tape reduction, considering we have had two decades of underwhelming attempts to do so. But other countries and jurisdictions have managed to cut red tape, cut it deeply, and are better off as a result. It requires a political willingness to commit – and to be seen to commit – to genuine reform, underpinning by a deep understanding of the harm that red tape is causing to the Australian economy, to Australian jobs, and to Australian prosperity. We are in a point in history where alternatives to regulation and the old way of doing business are thriving – changes caused by technology, by education, and a highly specialised and open market. To fully exploit these changes into higher living standards we need to cut the red tape that was designed for earlier eras, and prevent governments from adding more. But I’d like to finish with a brief reflection on the deeper harm that red tape does to us as a society and as individuals. That is, the moral consequences of red tape. When the government imposes red tape on our economic activities, on the businesses we create, on the people we seek to employ, on the goods and services we deliver to the community, it is asserting a control that is deeply paternalistic and disempowering. It is a claim that governments know better than their citizens about how to care for the environment, how to develop a safe and effective workforce, how to run machinery, how to move goods between two points on a map, what employment conditions are more fair, who should be able to practice a profession. It elevates the preferences of bureaucrats over the people they are supposed to work for. And it does so at the expense of the economic growth Australia’s economy desperately needs. It is no exaggeration to say that red tape is the most fundamental challenge that faces the Australian economy. We believe that the public understands this. But our job now is to convince the political class to do something about it – to cut red tape and unleash Australian prosperity. The fundamental problem with the Turnbull Government’s innovation statement is that it is a category error. The only thing governments can do to the “culture” of innovation is hurt it. When he first took the leadership, Malcolm Turnbull was right to describe our economic growth challenge as one of boosting innovation. The problem has always been what on earth that means. Now we know. The policies in Monday’s innovation statement try to do two things. Unfortunately, they’re both underwhelming. First, the Government wants to buy innovation. All those tax offsets, capital gains tax exemptions, and adjustments to the way the tax office treats company losses are trying to trade government revenue for corporate innovation. Same with the money for the CSIRO and the incubator support program, money for “landing pads” in Silicon Valley and Tel Aviv, and money for quantum computing. Can governments buy innovation? Unlikely. This is a longstanding debate in innovation policy. It is certainly true that if you throw an unlimited amount of money at professional researchers they will eventually research something useful. But as my colleague Sinclair Davidson has pointed out, the OECD is unable to find any relationship between economic growth and public spending on research and development. The OECD speculates that public spending on research crowds out private spending on research. More prospective is the second approach taken by the Turnbull Government’s innovation statement: clearing existing regulatory barriers to private sector risk taking and entrepreneurship. In this category are the insolvency reforms – which reduce bankruptcy periods from three years to one year – safe harbours for insolvent trading, and changes to the law governing employment share schemes. Yet these policies are miserly in comparison to the generous policies on the spending side. They barely scratch the surface. The thing about regulatory barriers to innovation is that they exist for a reason: either because they have constituencies who support them, special interests who rely on them, or politicians who lean on them for populist benefit. The real barriers to innovation are those steadily accumulating regulatory burdens that hold new products and services back for government approval and divert the attention of entrepreneurs to regulatory compliance. Think how data retention has gunked up the internet industry, how the regulatory uncertainty of the NBN has slowed down telecommunications investment, how financial innovation is held back by the labyrinth of regulatory controls on financial products. The Australian Government’s left arm doesn’t know what its right arm is doing. For instance, it takes a special kind of cognitive dissonance to ignore the fact that while the Government is trying to create Apple-like and Google-like companies in Australia, it is at the same time trying to target the real Apple and Google for what is alleged to be corporate tax avoidance. One of the big reasons these firms have apparently low tax profiles is because they take advantage of the research and development tax credits successive governments have introduced to boost innovation. The other reason that they have low tax profiles in Australia is simply because they’re not Australian companies, and much of their economic activity occurs offshore. Yet under the Federal Government’s multinational tax avoidance legislation (which passed both houses last week) the tax office will estimate how much tax they reckon multinational firms like Google and Apple should be paying, rather than how much they are strictly liable to pay under current tax law. This legislation creates enormous uncertainty and is almost guaranteed to push economic activity and innovative firms out of Australia. Why would multinational companies risk being taxed twice? How on earth can the Turnbull Government reconcile its anti-global approach to corporate tax with its apparently pro-global vision in the innovation statement? In the specific case of Google, the difference between innovation rhetoric and policy practicality is even more stark. Under our archaic intellectual property laws, an Australian Google would be unlawful. Google in the United States relies on a fair use defence in copyright legislation to copy the text of websites onto its servers for searching. But we have no equivalent fair use provision to allow such uses. Google would be legally vulnerable in Australia: our copyright laws constitute “a significant and unacceptable level of business risk”. Yet the Australian Government has repeatedly rejected introducing a fair use exemption for copyright, despite the advocacy of the Government’s own law reform commission. Movie studios and record labels don’t want fair use, and have lobbied hard to prevent it. The economist Mancur Olson developed an influential and depressing theory of economic growth in his 1982 book The Rise and Decline of Nations. In Mancur’s view, innovative, entrepreneurial economies develop powerful special interests over time that can prevent the sort of regulatory reform that economies need to grow. So ask yourself this. Are there any major special interests who will be upset by what the Turnbull Government proposed in their innovation statement this week? Not really. Sadly, for all the Government’s sound and light, very little has been “disrupted”. Finally there’s a serious conversation happening about the Australian Parliament’s scorn for democratic accountability and the rule of law. It was always going to be a bit controversial to propose absolute ministerial discretion to strip citizenship from dual nationals on the 800th anniversary of Magna Carta, that great symbol against arbitrary power. But we’ve had a rule of law problem for a very long time in Australia. Long before the Islamic State. Long before al-Qaeda. And that problem has gone largely unnoticed – whether due to a lack of awareness or a lack of interest – by those groups now furious about the Abbott government’s national security policies. Let’s start with the most basic rule of law principle: that we all deserve legal protections when accused of an offence, whether that offence is terrorism or traffic violation. Last year the Institute of Public Affairs conducted an audit of all Commonwealth legislation and found 262 provisions of federal law that violated fundamental legal rights. These either removed the right to silence, removed the privilege against self-incrimination, reversed the burden of proof, or did away with “natural justice” – the suite of rights like the right to a trial, to appeal judgments or to know what we are charged with. These violations aren’t just found in the sorts of laws that the human rights community was talking about this week – anti-terror and immigration laws. They’re found in economic laws like the Australian Competition and Consumer Act 2010 (that regulates mergers and consumer protection) or the Navigation Act 2012 (which regulates shipping) or the Broadcasting Services Act 1992 (which regulates broadcast media). The Fair Work Act violates all four legal rights. In other words, they’re targeted at people in business, not just people in terrorist organisations. The Tax Administration Act has nearly as many violations of the right to natural justice as the Migration Act does. Shortly after the 2013 election, the new attorney-general George Brandis directed the Australian Law Reform Commission to look at laws which limit traditional rights and liberties with a particular focus on workplace, commercial and environmental law. You’d have thought such an investigation would have been well covered already by the Australian Human Rights Commission. But the commission, along with Australia’s human rights community more generally, have utterly neglected limits on personal freedom when they are bundled up with limits on our freedom to trade, truck and barter. In a recent speech, the commission’s head Gillian Triggs pointed to all the post-September 11 laws which limit rights in the name of anti-terrorism. What about those which limit rights in the name of market failure? It’s only economists and the occasional corporate lawyer that have been talking about, for instance, the draconian powers of the Australian Securities and Investments Commission. Of course, rule of law is about more than personal legal protections. It describes the principle that administrative decisions should be made by elected officials and according to due process. Parliament should write the laws and control the purse strings. Many of these principles can be traced back to Magna Carta. These principles have come under sustained assault in recent decades. The prospect of ministerial discretion to strip citizenship without judicial review is just a tiny window into a much deeper problem. For instance, Australian governments have vested more and more decision-making power outside Parliament and into “independent” bureaucratic agencies. These undemocratic, unelected officials have enough discretionary power to effectively make government policy. Just last month the Tax Commissioner was granted the power to change tax law if he felt doing so would be in the interest of taxpayers. But it is Parliament’s job to make and amend the law of the land, not the bureaucracy’s. Other regulatory agencies have similar powers. In many ways Australia is not a liberal democratic state, but a democratic-administrative state, where power is shared between elected representatives and a permanent network of independent bureaucracies who are only loosely answerable to Parliament, let alone voters. Some of the basic institutions of our government are undemocratic. Gillian Triggs was right to say our democratic freedoms are under threat. Still, did she see any irony in the fact that the democratically elected Abbott government obviously wants to fire her but – since she commands an independent statutory agency – it cannot? In 2012 Parliament passed a bill giving the government blanket authorisation to spend money on basically anything it wanted without having to ask Parliament’s permission first. The bill was rushed through with bipartisan support following the school chaplains case in the High Court. It was barely noticed by the press. Yet it was one of the most complete surrenders of parliamentary responsibility in the last half century. There are serious problems with the Abbott government’s citizenship-stripping proposal. Coalition members might be happy with Peter Dutton holding such power. But all governments are temporary. Will they be just as happy when the next Labor immigration minister is able to wield the same powers? This is the thing about the rule of law. Just as it protects good people and bad ones, it constrains good governments and bad governments alike. To abandon the rule of law is not just to abandon those protections, but to erode democracy itself. Back in 2007, Kevin Rudd thought he could make a big political statement by outflanking John Howard as a free marketeer. He claimed to be the true “economic conservative”, and attacked the Howard government’s “reckless spending”. But that was just half of Rudd’s pitch. A headline in the Australian Financial Review in October that year screamed, “Labor blasts PM over red tape burden”. Readers learned that Rudd had “savaged” the Coalition for the regulation that was “strangling” business. “Stand by for the Regulation Revolution,” said theSydney Morning Herald; “cutting back the maze of business regulation and red tape” would be one of Rudd’s “top policy priorities”. They say the past is another country. Campaigns are another planet. Once handed power by the Australian voters, the practice of the Rudd government was light years away from its soaring campaign rhetoric. Yes, true to Rudd’s promise, Lindsay Tanner was appointed Australia’s Minister for Finance and Deregulation. Yet one of Tanner’s first acts as minister was to preside over a vast increase in regulatory control over the finance sector, adopting new federal anti-money-laundering and counter-terrorism-financing laws that had been prepared by the Howard government. This was just a taste of things to come. Tanner was our first deregulation minister and the experiment was a failure. Just as he was unable, as Minister for Finance, to prevent the massive splurge of government spending instigated by Rudd, Wayne Swan and Treasury Secretary Ken Henry, he was unable to hold back the tidal wave of new regulation that came with an interventionist government. By the twilight of the Labor government, this wave of regulatory interventionism had become a flood. Rudd’s professed disdain for the red tape burden strangling business was forgotten. Vast new regulatory frameworks were being imposed on labour markets, financial markets, employment conditions, child care, hospitals and health, aged care, competition law, health and safety laws, higher education, charities, coastal shipping, and of course the environment. These increased the regulatory burden on individual sectors, but also the economy in general. For instance, the cost of regulation imposed on the mining and energy sectors flow through to raise the costs of downstream products. Just as taxes—like the carbon and mining taxes—reduce economic growth and living standards, so can regulation imposed on these vital sectors. Some of the most egregious new regulations were not successfully implemented. Communications Minister Stephen Conroy was unable to pass his large-scale attempt to regulate fairness in the press. Attorney-General Nicola Roxon was unable to pass her attempt to create a right not to be offended on everything from race to politics in the workplace. Roxon did however manage to pass that manifestly absurd and deeply symbolic instance of regulatory over-reach—plain packaging on tobacco products. These new regulations became a source of pride for the Labor government. Trying to combat the sense that parliament under Julia Gillard’s minority government was chaotic, Anthony Albanese used to brag about just how many pages of legislation Gillard had ushered through parliament. As the months ticked by the number grew ever larger. In six years, Labor passed a whopping 975 acts, adding up to 38,874 pages of legislation. It’s true that the volume of legislation is an imperfect measure of the growth in regulation, for a number of important reasons. It is indicative rather than demonstrative. It does not take into account the effect that each new piece of legislation will have, nor does it take into account the fact that some legislation might repeal existing law, thereby reducing the regulatory burden. On the other side of the ledger these figures do not include subordinate legislation nor any state laws and council bylaws. But it is extremely suggestive. And constant legislative change imposes its own costs, as we shall discuss below. In 2012 the Institute of Public Affairs calculated that there were 103,908 pages of Commonwealth legislation on the books. Rudd’s deregulation push may have been brazen, but every government comes to power promising to cut red tape. The Howard government had its own promise to reduce the regulation which was “enveloping small business” but the fruits of that labour are hard to see. Australia was more regulated after the Howard years rather than less, as I pointed out in the 2009 book The Howard Era. For all the stability and good governance that the Coalition offered between 1996 and 2007 it did little to stem the growing tide of regulation. Rudd wasn’t wrong when he diagnosed the red tape problem in 2007. It’s just that he wasn’t the person—and his party wasn’t game—to fix it. So how does the Abbott government shape up? There are positive early signs. On the headline figure of legislative activity, 2014 was a good year. There were just 135 acts constituting 4607 pages of legislation passed through the Commonwealth parliament last year. This is a drop from the more than 5000 pages passed in 2013, and happily well below the 8150 passed in 2012. No doubt this is in part due to the trouble that the government has had passing its bills through a hostile, unpredictable Senate. But it is also due to the efforts of the Coalition’s own deregulation minister, Josh Frydenberg, and the emphasis that the Abbott government has placed on its deregulation agenda. Abbott and Frydenberg made deregulation one of the central features of its economic message in the Gillard years, leaning heavily on reducing the regulatory burden as part of its plan to revive the economy after years of sluggishness. And yet. While the Abbott government repealed 57,000 pages of legislation in 2014—and claims to have saved the economy a whopping $2.1 billion a year—much of that which was repealed was already defunct. The real work of deregulation, if it is to occur, hasn’t started. Indeed, the Abbott government’s deregulation experience shows why this agenda is so hard to pursue. In 2013, the much-publicised “Repeal Days”—a single parliamentary day every six months dedicated solely to repealing law rather than introducing it—were important but, as they came around, their agenda items kept disappearing. For instance, the proposal to eliminate the entirely unnecessary gender-equality reporting requirements imposed on businesses with more than 100 employees had to be dropped, apparently for political reasons. The reforms to the Labor government’s Future of Financial Advice program, which would have taken the edge off some of the most extreme regulatory controls but nevertheless left the previous government’s regulatory framework largely in place, were implemented by regulation. In a surprise upset the Future of Financial Advice reforms were reversed by the Senate at the end of the year. Other deregulatory proposals—such as the deregulation of higher education—have floundered as well. Every regulation, even the most absurd, has a unique justification, and its own constituency. Gender-equality reporting is “not an issue of red tape”, according to Claire Braund, the head of an organisation called Women on Boards Australia. But it is the epitome of red tape—it imposes no other compliance requirements on firms except paperwork, and paperwork that has no other purpose except informing government. It should be the low-hanging fruit of regulatory reduction. There is not a single person in the country, except perhaps the bureaucrats that administer the program, who would be materially worse off if this requirement was abandoned. Yet gender reporting could not be repealed. In some areas the government seems intent on going backwards. The Abbott government started 2015 with a stalled budget and by talking up a range of regulatory increases. It’s clamping down on foreign ownership in property. It’s introducing new country-of-origin labels to food products. It’s talking about lowering the GST threshold on imports and digital products, which would require enormous new regulatory infrastructure for retailers and importers alike. It has passed legislation to impose new controls on social media websites to clamp down on cyberbullying and to require internet service providers to keep vast amounts of information on every Australian’s online activities just in case they are in the future suspected of a crime or regulatory violation. We can bat the pros and cons of these proposals around. They ought to be debated earnestly. But they illustrate that even a government as apparently dedicated to deregulation as the Coalition under Tony Abbott is nevertheless unable to resist the steady creep of new economic controls. There’s something much deeper going on here than traditional party ideology. While it is clear that Labor’s approach to regulation was worse than what we saw under the Howard government and what we have seen so far under Abbott, we’re talking about differences in degree, not kind. There is a deep and seemingly inexorable logic of modern democratic government that pushes it towards regulatory excess. Recognising we have a problem is the first step to solving it. And it is a problem. Each year the World Econ­omic Forum publishes a Global Competitiveness Report which rates world economies according to a large range of indicators that would help facilitate business. Australia does relatively well overall. We rate well on things like education, the soundness of our banks, the health of our population, the depth of our financial markets, the professionalism of management and so on. But we are catastrophically bad when it comes to “burden of government regulation”—a terrible 124th in the world, sharing a spot with such economic powerhouses as Iran, Spain and Zimbabwe. Our competitors rate much higher. The United States is at eighty-second, while Canada is twenty-ninth. The Australian Industry Group surveyed 241 CEOs in Australian businesses. The number of executives who nominated government regulation as one of their top three impediments to growth has grown from 9 per cent in 2011 to 11 per cent in 2014. This figure may seem relatively small in isolation, but given that it competes against other factors like the global economic and investment climate, it is strikingly high. Fully 83 per cent of CEOs believe they face a medium to high level of regulatory burden—particularly in the areas of industrial relations and health and safety. The Minerals Council of Australia commissioned a review of legislative controls on the mining industry. It found that the number of primary pieces of legislation overseeing project approvals nation-wide increased from ninety-four to 144 between 2006 and 2013. Subordinate legislation increased even more: from sixty-six in 2006 to 119 in 2013. As they told the Productivity Commission’s 2013 review into mineral and energy resource exploration, the largest mining states, Western Australia and Queensland, have some of the most onerous regulatory burdens. Hancock Prospecting’s Roy Hill iron ore project in the Pilbara has required a staggering 4000 licences, approvals and permits—much of them imposed by the state government. The cost burden of regulation is well known. But more important—and harder to test—is how regulations shape and constrain the economy itself. A modern economy is subject to constant shocks. Technologies change. Preferences change. New business models supplant old business models. Political events in distant countries can have unpredictable ricochet effects for Australian firms. Foreign price changes suddenly render existing ways of work unprofitable, or open up new opportunities. Firms have to constantly shift their operations, their ways of doing things, even their entire business models sometimes just to stay afloat. Economic change does not just occur in boom-bust cycles, nor in the long-term technological revolutions that have characterised the last two centuries. Tiny changes to supply lines, seemingly minor legislative changes in distant countries, and modest but constant adjustments to consumer goods mean that the economic ground is constantly shifting under the feet of the business sector. Contrast this unstable economic dynamism with the political system that proposes to regulate it. Statutes reflect the nature of the world only at the moment of their passage through parliament. Legislation is static—black words in leather books that can only be altered through fraught and complex political negotiation. Even minor, uncontroversial legislative amendments can take months. Serious change can take years, from green papers to white papers to exposure drafts to committee inquiries to law of the land. Each of those legislative changes that the Gillard government was so pleased to have overseen was a long time in the making—the fruit of months and years of bureaucratic busywork. As a consequence the economic environment depicted in statute is almost always long out of date. Embedded in each statute are assumptions—about the shape of industry, technological ability, the force of competition—which do not last. In other words, no matter how active the government is, the law is a static instrument. The economy it governs is dynamic. This creates serious problems. As rock beats scissors, law trumps business needs. Firms facing economic headwinds find that their ability to adjust is limited by the legislative environment they operate in: legal constraints are constraints on business flexibility. In an Institute of Public Affairs paper published in December 2014, Dom Talimanidis demonstrated the perilous decline in entrepreneurism in Australia. Where new businesses constituted 17 per cent of total businesses in 2003-04, in 2012-13 new businesses were just 11 per cent of total businesses. Unsurprisingly, the relative decline in business entry is greatest in those states that are the least economically free. The burden of regulation is most obvious when we look at individual firms—the time spent on paperwork, the business opportunities not pursued. But all these little disincentives and distractions add up. Regulatory excess can have serious macro-economic consequences. In an important paper published by the Swedish think-tank Research Institute of Industrial Economics in January 2015, the economist Christian Bjørnskov looked at the relationship between standard measures of economic freedom and economic crises. As Bjørnskov finds, a high degree of economic freedom does little to prevent countries from suffering an economic crisis. But the degree to which an economy is free is a very important factor in how quickly a country recovers from a crisis. The things that matter here are not whether taxes are low, government spending is modest, or whether the rule of law is strong, but how efficient the regulatory environment is. Economic crises necessitate a large-scale reallocation of resources, away from troubled sectors and into more stable ones. At the individual level, a person who has lost a job in an economic crisis needs to move rapidly into new employment—perhaps even new employment in a new industry—before the harm of unemployment becomes too manifest. Regulations like occupational licensing and industrial relations laws that raise the cost of employment act as a handbrake on the necessary economic adjustment. All regulation in some way prevents resources from being used alternatively—even if it is just the opportunity cost of time spent filling out gender-reporting forms. Even when regulation is desirable, we have to recognise that all regulation makes for a less flexible economy, and one less able to adapt to change. One possible answer to the problem of legislative immobility is for parliament to grant a certain amount of discretion to adjust and interpret regulations according to changing circumstances. This is what we do when we hand decision-making power over to regulatory agencies. Yet vesting unelected regulators with discretionary power does more harm than good. It exacerbates regulatory uncertainty, with serious consequences for the private plans of individuals and firms. It facilitates regulatory “capture”. And of course it has a democratic legitimacy problem—under whose authority do regulators make what are effectively public-policy decisions? Nevertheless, policy-makers today lean heavily on delegation to regulatory agencies, handing them quasi-legislative power. In an important book, Is Administrative Law Unlawful? (2014), the Columbia Law School professor Philip Hamburger traces the origins of such delegated legislative power back past the creation of regulatory agencies at the beginning of the twentieth century—where most scholars’ history stops—all the way to the pronouncements of medieval kings. Hamburger draws a distinction between administrative pronouncements by executive governments that are intended to bind officers of the executive and those that are intended to bind society more generally. The former form of pronouncement is obviously necessary for government to function. Bosses need some way of instructing their employees. But pronouncements that affect the public more generally ought to be the purview of the legislature, not the executive. These are more akin to the exercise of the royal prerogative than democratic law. We often imagine that our modern concerns are distinct from those of the past. But how much legislative power the executive could exercise without parliamentary approval was one of the great contests in the lead-up to the English Civil War. The seventeenth-century English historian Roger Twysden declared that “the basis or ground of all the liberty and franchise of the subject” was “this maxim, that the king cannot alone alter the law”. Yet through executive pronouncement and delegation governments have vested vast legislative power in what scholars call “non-majoritarian” regulatory and bureaucratic agencies. I doubt whether the significance which the certainty of the law has for the smooth and efficient working of economic life can be exaggerated, and there is probably no single factor which has contributed more to the greater prosperity of the Western World, compared with the Orient, than the relative certainty of the law which in the West had early been achieved. So laws ought to be clearly spelled out. They need to be “known”. Their consequences and significance ought to be discernible to all those who are expected to follow them. We ought to limit the discretion that administrators and bureaucrats have in applying the law. The more intense and accelerated is the process of law-making, the more uncertain will it be that present legislation will last for any length of time. Moreover, there is nothing to prevent a law, certain in the above-mentioned sense, from being unpredictably changed by another law no less “certain” than the previous one. Thus, the certainty of the law, in this sense, could be called the short-run certainty of the law. For anybody who had a time horizon longer than that short run, the law was anything but certain. Leoni’s book was published in 1961. His lifetime (Leoni was born in 1913) had seen enormous economic and technological change, but the scale of those changes pales in comparison to the shifts in technology and business that we are seeing today. In just a few years entire industries have shifted out of the terrestrial world into online. Ubiquitous communications have made older traditions of work obsolete. It is absurd that we have shop trading-hour regulations, as still exist in Western Australia, co-existing alongside always-on mobile internet shopping. While firms like Uber and Airbnb are revolutionising transport and accommodation respectively, they present a competitive threat to the taxi and hotel industries that have been lumbered with long-standing and costly regulation. Stretching our view slightly further into the future, today’s regulatory assumptions are going to be challenged by new technologies like 3D printers, consumer drones and digital cryptocurrencies like Bitcoin. No matter how manic is the legislative activity that characterises our political system, it is nevertheless unable to keep up with social and technological change. Despite the small but important successes of the Abbott government in reducing some regulation and clearing the statute books of anachronisms, it is obvious that the deregulation movement has stalled. Deregulation is now more a political slogan than a serious public-policy project. Politicians have ceased trying to justify the purposes of deregulation and now treat deregulation as a good in-and-of-itself. This is a testament to the intellectual success of the deregulators of the past—who made the case for lower regulation a virtual self-evident proposition—but it has left the political class with little appetite to actually argue the case for needed reform. When each side has committed itself to deregulation, all that remains is a rule-in, rule-out game. Unfortunately, in the nature of politics, rule-outs are more common than rule-ins. The populist pressure for new law is far greater than the intellectual pressure for less. Thus the deregulation stalemate, a stalemate more pernicious as we move towards an unpredictable economic future and hyper-innovations in technology. The issue is not how many “repeal days” are scheduled in a year. The issue is how the government sees its relationship with the economy. We do not lack alternatives to the over-regulation path we have taken. Leoni was an advocate of the common law—the system of private, particular and iterative law-making vastly superior to the statutory law which now dominates our legal systems. Rather than expecting politicians to play constant catch-up with economic and technological changes, the common law would allow legal issues to be solved when they arise. Law can be discovered, rather than imposed. Hayek spoke of “generality” as an ideal of the rule of law. In modern regulatory parlance this is akin to “neutrality”. Four decades ago the Fraser government’s Campbell Committee into financial regulation spoke of “competitive neutrality”, just as the Rudd government’s Convergence Review into media and communications regulation spoke of “technological neutrality”. The idea is that products or services that compete with each other should face the same regulatory burden. Deposits in building societies should be regulated the same way as those in banks. Video broadcast over television channels should be regulated the same way as video served over the internet. Neutrality has proven to be more of a catchphrase than a policy program. This is because genuine regulatory neutrality undermines some of the most fundamental assumptions of government economic management. To regulate is to control. Every advocate of new regulation has an idea of the world that their proposal would create. Regulation is always purposeful—it has a goal, a vision of a fixed future. For all the valuable discussion of technological neutrality, Labor’s Convergence Review collapsed into absurdity when it was unable to shed a fundamental belief in the ability of governments and regulators to shape the world around them. Rather than reducing the burden on highly regulated television services, it proposed to expand those regulations onto the ungovernable internet. Neutral, yes. But also absurd. The Convergence Review offers a microcosm of the broader regulation problem. Regulatory excess is the result of governments trying to impose their values on the economy—using law to shape the economy according to their own preferences rather than allowing the economy to flow unpredictably according to consumer demand and entrepreneurial experimentation. In that sense, it is a reflection of the political system from which it emanates. If the Abbott government wants to go down in Australian history as a significant reform-driven government, then the “deregulation agenda” is not enough. It needs to start a serious rethink of the relationship between the dynamic, entrepreneurial economy and the static but over-energetic regulatory state. In the 2012-13 financial year, the Australian Labor Party received $55 million in donations. The Liberals received $73 million. The Greens and the Nationals attracted around $8 million each. Name a large corporate in Australia and their name is almost certainly somewhere on the Australian Electoral Commission’s donations register. Lots of firms even donate to both sides. And of course the Labor Party has a healthy union donor base as well. But that’s only a fraction of the total amount of money spent on trying to influence government. Federally, Australia has 590 registered individual lobbyists representing 1,708 corporate and non-profit clients. Then there’s all the money firms spend lobbying with their in-house government affairs staff (who don’t show up on the lobbyists register). Sounds like a lot? But consider this: the Abbott Government says it plans to reduce the regulatory burden by $1 billion every single year. Never mind how accurate that figure is. $1 billion is an enormous amount. It makes the amount of money spent on lobbying and rent-seeking in Australia seem tiny by comparison. Whole industries live and die on the regulations and taxation laws imposed upon them. A new regulation, or a tiny alteration of an existing one, might destroy an enterprise or create a monopoly. So the real question is, why isn’t there more lobbying? Why don’t firms spend much more money trying to influence the political process than they do? This is called the Tullock Paradox, named after Gordon Tullock, the great American political economist who died last week at the age of 92. The puzzle is even deeper because we have lots of evidence that suggests the return on investment from lobbying is enormous. One American lobby group brags that for the $11 million it charged its clients in fees, it has delivered $1.2 billion in regulatory advantage. An academic study found that $1 of lobbying resulted in $220 in benefits – an incredible 22,000 per cent return on investment. There are a few possible ways to resolve the Tullock paradox. Tullock titled the 1972 article where he outlined this paradox “The Purchase of Politicians”. But perhaps politicians aren’t available for purchase, and the examples we have of large returns for small amounts of money lobbying are, in truth, just coincidences – the government was likely to make that decision anyway. Alternatively, perhaps the returns to rent-seeking are so unpredictable that firms see it as a gamble. If so, then the big lobbying windfalls are extreme outliers. Most experiences with lobbying aren’t as incredibly successful. Or businesses might not be aware of the opportunities that lobbying presents – they might be irrationally avoiding easy opportunities for profit, or wrongly believe it’s not worth their time to learn their way around the complicated world of rent-seeking. Perhaps corporate donations are given with no expectation of benefit. Individuals donate to political parties as a form of expression. Maybe corporations do as well. Perhaps, by donating, or even by lobbying, they seek to signal to regulators and consumers than they’re in the tent, rather than outside it. They’re cooperating. Or perhaps corporate executives just enjoy the access to celebrity politicians that being a big donor can assure. We shouldn’t assume that executives, who decide whether to donate and how much, are always acting in the best interest of their shareholders. Anyway, lots of possibilities. Some are more plausible than others. But the Tullock paradox isn’t just a little intellectual conundrum, and it isn’t just about clarifying how much money is spent on politics. Rather, it’s a window into one of the central dilemmas of government – how can we ensure that government works in the interest of the people who elect it? The lesson from the vast literature on rent-seeking that has sprung up since is simple: where there is political power, special interests will try to capture that power. It’s easy to think of ideas for new laws or regulations or government programs that might, on paper, make us better off. But these laws, regulations and programs won’t be introduced by benevolent and omnipotent dictators. They’ll be introduced by politicians and bureaucrats – plain old humans, swimming in a pool of competing interests. The more a government does, the more opportunities are presented for rent-seeking. Rent-seekers thrive in the minutiae of policy detail. Corporations know much more about how regulations affect their business interests than regulators or politicians do. It’s not hard for lobbyists to take advantage of that knowledge gap. Resolving the rent-seeking problem isn’t as easy as banning or restricting donations, putting barriers in front of lobbying firms, or any of those other solutions we regularly hear. The Tullock paradox emphasises how enormous the gains from rent-seeking are. With such great windfalls available, money is going to flow into the system no matter how we try to prevent it.